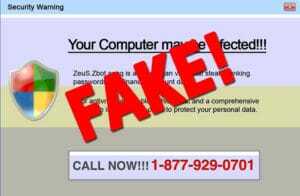 Computer Tech Support Scams are everywhere and rising! Scammers posing as computer tech support people from Microsoft, HP, Dell or other computer companies are calling consumers to notify them that their computer either has windows problems, viruses or other issues that need immediate attention. These computer tech support scammers try to get remote access to your computer so that they can do repairs, and ask a ridiculous amount of money ($200 or more). What they really want is access your online banking information, passwords, or install spyware that monitors your keystrokes. Microsoft has no relationship with these people. Microsoft or other companies will never call you out of the blue. According to Microsoft, after gaining access to the computer, these callers can then install malicious software, steal personal information, take control of the computer remotely or direct consumers to fraudulent websites where they are asked to enter their credit card information. Your computer is infected with a virus and it has been reported to our company. Your computer is infected with a virus and it is sending out spam emails to people. Your computer is reporting critical software or hardware errors, and it is in danger of failing. Your Windows Operating System is corrupted and about to fail. Follow these tips to protect yourself from this scam. Never, ever grant remote access to your computer to any unknown parties. Scammers will ask you to go to your computer to access the problem and allow them access. If a caller ever asks you to grant them remote access, just hang up right away. Obviously, install an anti-virus program to protect your computer and personal information. If you have Windows 10, the built in Windows Defender is a decent anti-virus program, but the top 3rd party programs are better. You should not install more than one antivirus program, but adding an anti-malware program (slightly different than anti-virus programs), such as Malwarebytes gives you even more protection. Make sure you have automatic updates turned on for Windows. This is on by default, so do not turn it off. Update web browser software regularly. These also auto-update by default. Protect your passwords by keeping them in a safe place. Create different passwords for each online account that you have. Do not open or respond to emails or click links from unknown senders. This might infect your computer with malware or confirm that a spammer has reached a valid address. Find a computer tech support and repair company you can trust. Go to the BBB to find an Accredited Business you can trust. Run a virus scan. Run a malware scan with Malwarebytes (see link below). Change the passwords for your computer, email and online banking/credit card accounts. Consider placing a fraud alert on your credit report if you shared personal and banking information with the scammer. Steve Frantzis is the Owner of Saguaro PC Tech, LLC, a computer repair shop in Tucson. If you have any questions or need help with your laptop, desktop, Mac, or mobile device, please call Us at (520) 250-5948.